At one point of time, making pizzas was a weekly affair at our place. Fridays meant pizzas or lasagnas. Its been sometime since we made pizza at home, which is funny, considering the fact that I have two different varieties of pizza sauces sitting in the fridge. I have tried using the ready-made pizza sauces available in the market, but I found them too sweet for my taste. So I make them at home. This one of the frequently used recipes for making the sauce. I usually double this recipe and store it in the fridge. There is another recipe with ready made puree alone, I will be posting that soon sometime. In the meanwhile, make this at home, spread it over a pizza, bake them and enjoy biting into that hot cheesy bite! This is my entry for the second day of Blogging Marathon 25, under the theme ‘Cooking from CookBooks’. Check out the page for more recipes and more themes from participating bloggers. Heat oil in a pan. Add garlic and saute for a minute. Add all the other ingredients except vinegar. Bring to a boil, and simmer for 7-10 minutes stirring now and then. I do this in a pan with lid, else the tomatoes splutter all over. Taste and adjust seasonings accordingly. Add vinegar. Boil till the sauce becomes thick enough to spread without being runny. Remove from fire. Store in clean glass bottles once cool. 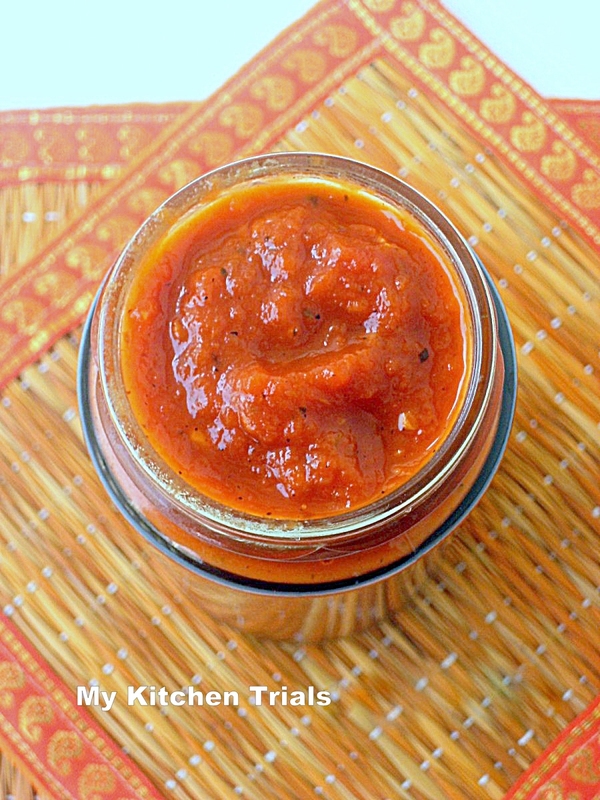 This is such a simple recipe and I sometimes wonder why I also rely on store bought pizza sauce. No light box, Kalyani. Its just white color chart paper :D! 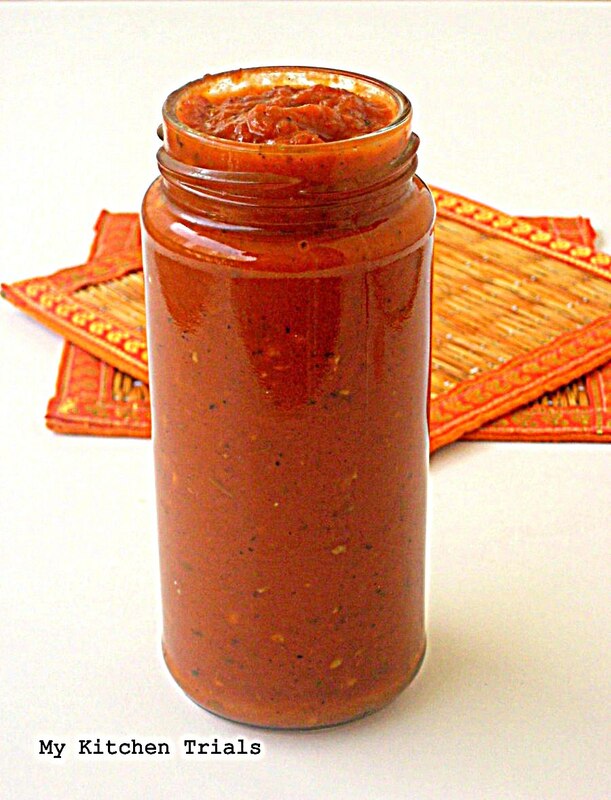 Homemade pizza sauce, nothing can beat this. Nice home made pizza sauce,loved your sauce pan..
Looks wonderful Rajani, though I remember making homemade pizzas most times, I just used to make the sauce for that time..never tried storing it beyond a duration…good one to follow! This is a very good thing to have on hand. I always stay away from the store bought sauce because of their very high sodium amounts. making this at home makes it very healthy. Beautiful mats Rajani I wanted to tell you this in vatha kozlambu post but for got any way they looks prity. Home made soucr is always best and taste good to .. and your recipe take less time too… nice one. 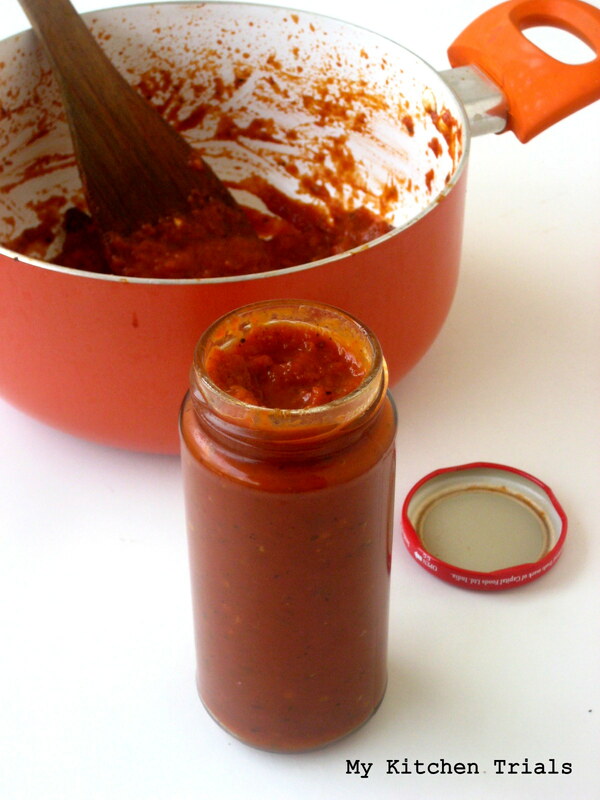 Pizza sauce looks so simple and easy to make. bookmarking the recipe.. Tried it and loved it. Thanks rajani.